There is nothing quite like the sound of harp harmonics on your acoustic guitar. This technique is one of the most amazing, magical, and mind blowing things you can do! Once you start, you won’t be able to stop, you’ll be hooked on harp harmonics as soon as you hear how great they sound. I know I certainly was. Listen to the opening part of the video below if you’ve never heard harp harmonics before to see what I am talking about. Also known as cascading harmonics, this technique will dramatically increase the dynamics and range of your acoustic guitar playing, not to mention knocking the socks off those who hear you play them, jaws dropping to the ground. The reason why this technique is referred to as “harp” harmonics is because when playing them, your guitar very much sounds like a harp. Today I am going to show you exactly how to get awesome sounding harp harmonics into your acoustic guitar playing. With just a little practice you will be well on your way to mastering this breath taking technique. The technique for harp harmonics will be quite unlike anything you have done with your guitar playing before. While a picture may be worth a thousand words, a video is worth even more, so be sure to watch the video above to see this technique demonstrated for you in great detail, and reinforce what we are about to cover now. Using your fingers is perhaps the most natural way to play harp harmonics. Your bare thumb will be used to pluck the string. It is a slightly different sound compared to using a plectrum or thumb pick, with the harmonics not quite having the same sustain or resonance but still sounding great all the same. Using a plectrum is great if you are integrating harp harmonics into regular plectrum based guitar playing. You will however have to grip the plectrum between your thumb and middle finger so as to free up your index finger to play the harmonic (more on this shortly). This will leave you with only your ring and pinky fingers to play regular notes along with your harmonics. This is fine, but with the bare thumb approach you will also have use of your middle finger for playing regular notes. A thumb pick gives you the best of both worlds. You get the sustain of the harmonic from the pick, as well as the use of your middle, ring, and pinky fingers for the regular notes. I generally like to use a thumb pick for most of my harp harmonic playing, however the approach you choose is totally up to you. For today’s article I will be using the bare thumb/thumb pick approach. To get the harmonic sound you will be using the index finger of your picking hand. We will start with the natural open string harmonics situated at the 12th fret, so you can give all your focus to the picking hand without having to fret anything for now. Simply take the index finger, of your picking hand, and place the tip of it directly over the 12th fret of the bottom string of your guitar. Don’t place it in-between the frets as you do when playing regular notes, it needs to be directly over the top of the fret itself. You only need to just touch the string. It is the lightest of light touches, anymore and the harmonic will sound suffocated at best. Once in this position, use the thumb of your picking hand to pluck the string the index finger is touching, from behind. The resulting sound should be a bell like harmonic. Check the picture for reference. 1. Keep your index finger straight at all times. Notes that are to be played as harmonics are indicated with a colon (:) symbol next to them. For now all notes are played as harmonics, however shortly we will be adding regular notes. Now that we have the foundation for sounding our harmonics, we can step it up a gear and apply them to actual fretted notes, not just open strings. This one thing will MASSIVELY increase your use of this great technique. When applying harmonics to fretted notes you must always maintain a distance of 12 frets between the notes your are fretting and the harmonic that your index finger is sounding. This is why we were able to sound the harmonics of the open strings at the 12th fret, and not the 13th or 11th frets, as we were exactly 12 frets above the open strings. 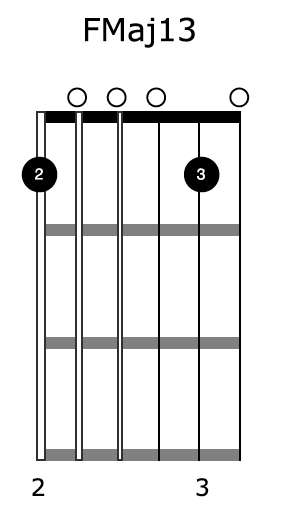 To sound the harmonics of this chord, simply place your index finger directly over the 15th fret, which is exactly 12 frets above from where you are fretting your notes. Remember to keep a very light touch, and to pluck the string from behind with your thumb as described earlier. Notice we have to adjust where we play our harmonic on the 4th string to stay true to the shape of the C9 chord we are fretting. This harmonic is sounded by placing our index finger directly over the 14th fret, with the others located at the 15th fret. 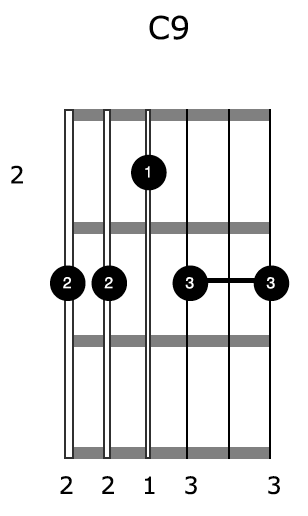 Here is another example, this time tracking the shape of an FMaj13 chord which contains both fretted and open notes. While our harmonics already sound great, this is nothing compared to when we add regular notes into the mix. This is where we get a cascading harp like sound on our acoustic guitar. 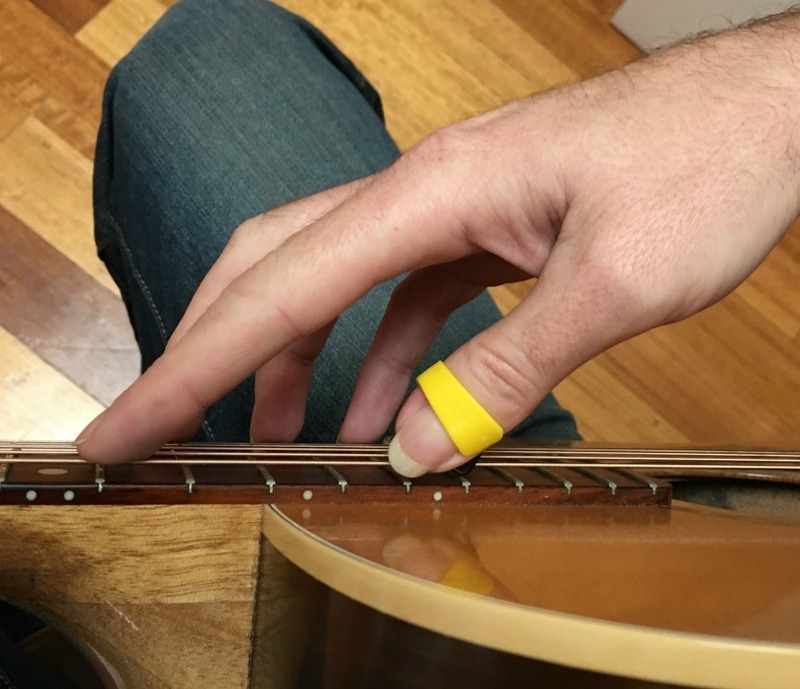 Provided you have the correct position for your thumb and index finger, you’ll find the ring finger of your picking hand will be nicely positioned to pluck the open strings. Having said this, take your time, and be patient. Your picking hand has never done this sort of thing before, so expect it to feel really unfamiliar at first. In each examples above, the picking hand is doing exactly the same pattern regarding the harmonic and regular notes. 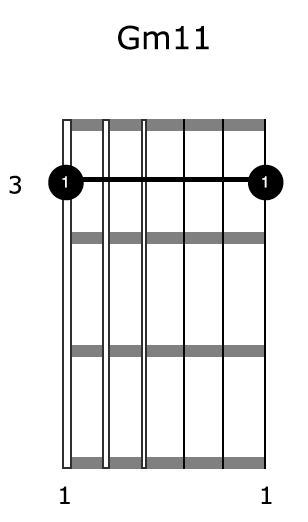 The only difference is where the harmonics are located (always 12 frets above the fretted note), producing a different shape for your picking hand to track depending on the chord you are fretting. You think this sounds cool, wait until you hear just how far you can go with harp harmonics in your guitar playing. The possibilities are absolutely mind blowing to say the very least.